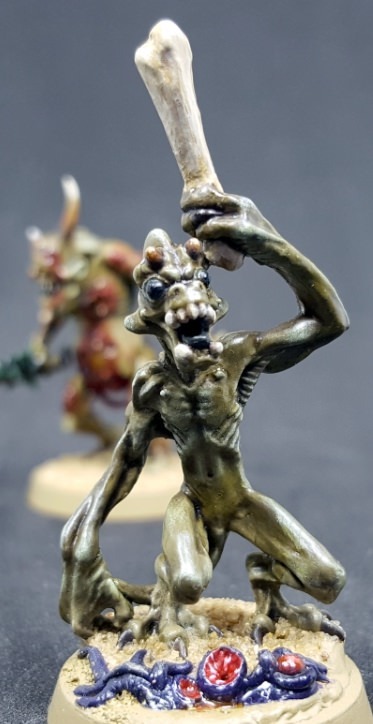 Neglected Models February 2019: Community Painting Challenge | Azazel's Bitz Box. But what is a “Neglected Model Challenge“? Well, it’s as simple as it sounds – Simply complete a single model (or more if you want) that you started painting awhile ago, but still sits unfinished. I suggest 6+ months, but that depends on what your backlog is like. So if you’re keen for it, no need to sign up. Just pick a model that’s been neglected and during the month of February, make it into a completed model. If you’d like to be included in the wrap-up at the end of the month, it’s super helpful if you post a link in the comments section of THIS post, so everything is in one place when I go to stitch it all together. Because someone’s work always gets missed, at least initially! Krautscientist from Khorne’s Eternal Hunt completed his converted model of Interrogator Chastity of the Ordo Hereticus. Alex from Leadbaloony finished this Necron-with-no-name, hiding out on the Imperial fringes. Just Needs Varnish completed a trio of 20mm Japanese Type 89 Medium Tanks. Mikeland82 from Starship Vorenus completed three sets of models this month – finishing a repaint of an old-school/oldhammer Emperor’s Hammer Space Marine Rhino APC that had been outstanding for some time. Finally (firstly, actually) Mikeland82 completed this rather wonderful female Soviet Sniper, hitting both the Neglected model challenge as well as the Fembruary Challenge. Wargamer Eric would be quick to tell us that “I AM THE LAW!” Or his figure would, at least, with a Dredd-inspired Forgeworld Imperial Enforcer. Steinberg Shed Space finished a model that’s pretty familiar to me recently, the 2nd release of the Great Unclean One of Nurgle. Argentbadger has painted Hannah, Chief Freikorps Archivist for Malifaux. 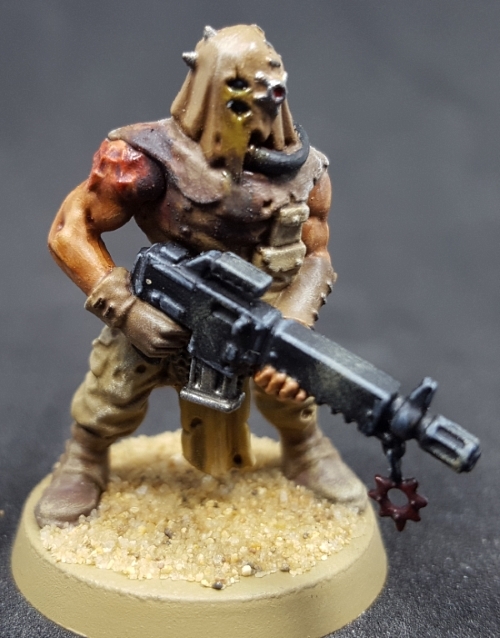 Ann from Ann’s Immaterium completed a Chaos Cultist that had been bugging her for some time. 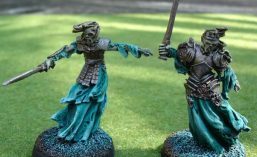 Ann also painted up Sebelex: Devourer of the Dead who had been languishing for a year or more to join her Plaguebearers. This entry was posted in Monthly Painting Challenges and tagged Miniature Painting Challenge, Neglected February '19. Bookmark the permalink. Those are some fantastic entries! Nice little flashback! Hopefully this year I’ll manage at least something for each of them. It would be very cool if you’re able to do so! Cool to see those entries, as I hadn’t yet discovered this wonderful blog a year ago. I absolutely love that Necron-with-no-name! It’s also great to see that at least most of the authors seem to still be active and taking part in these challenges! I’ll have to see what I’ll work on for this challenge.. I’ve got only a couple of models which I have started painting but not finished, and they’re not even 6 months old. But I do have a good bunch of assembled/primed models which are certainly neglected, and for 6+ months if memory serves. Cheers mate – and it sounds like you just figured out a few eligible models! I’ve said it before, and I’ll say it again – these challenges are great. Thank you for putting in the time and effort to run them. I had three centrepiece models that I’d ahve liked to do, but all three are (luckily?) also Neglected Models, so whatever I don’t finish “on time” in January, will also be eligible for February’s challenge! Luckily, you and I are the only wargamers with neglected models! So I hear. We’ll have to carry the weight of the burden of neglected models for the community. Oh, Eric? You too? Okay, that’s one more wargamer with some neglected models! That’s some lovely stuff from last years ‘challenge’. Embarrassingly I’ve only just discovered your blog but thanks to Kraut Scientist I’m happy to see another entertaining and enjoyable blog. These ‘challenges’ are great for an eclectic hobbyist like me that is so easily distracted by the next idea that pops into my head. I have a shed full of unfinished miniatures, not least of which is finishing my House Escher gang. Hopefully the name plates I’ve ordered will arrive in the next couple of weeks and this will give me the perfect opportunity to finish ’em off. All good mate – and I know exactly what it’s like to be just a touch eclectic and butterfly-like in my hobbying! I’m in- I’ve stuff been hanging around in the shed for months…. If I don’t finish some of January’s scenery challenge stuff it actually qualifies for February’s neglected model challenge! I’d like to think that’s good planning, but that would imply I actually plan anything. Nice to see this round-up again and thanks for the mention – I can’t believe it’s nearly a year since I painted those tanks! Nice trip down memory lane. Don’t think I had started any challenges at this point. I for one, really appreciate that you set guidelines but are pretty flexible about the details. It makes it easy for everyone to participate and fun. No problem – If they weren’t flexible, they wouldn’t work for *me* – let alone other people joining in! Nice recap, and I have a few neglected models on my tray for the year, so I’ll definitely be in! Great mate ,I’m really impressed that I’m having a go at something that you have set up and has really stood the test of time ! ,great fun and just to let you know I’m on track and I feel I might just squeeze in if the warm weather persists so the new moat dries ! .Tick Tick Tick ! . Nahh! a young bloke like yourself and all the all the other enthusiasts I’m sure it will keep going ! ,I had a one of BBQ in 1980 to thank all my friends that welcomed me back to Auss after 2 year absence ,guess what it was such a success it went on for another eight years ! ,so what out matey there could be a lot more activity coming you way ,busy boy ! . Photo shoot tomorrow and if I can deal with the next hurdle !! !technology I might be in on the challenge !!! ,yeh he ! . I tell you – I feel older every day at the moment. It’ll be a young bloke like you taking over at this rate! These are great to see again. I am bereft of neglected models (as defined in the challenge) as I was last year, so I will have to watch from the sidelines and cheer the rest of you all on to glory! Too bloody efficient, Mark. You’ll have to assemble and prime a huge batch of models, then work through them slowly so you can claim some of them as “neglected” every few months! High praise as your output is amazing! Pingback: Breaking News: February’s Paint Challenge goes dual-mode. Terrain added to Neglected Models! | Azazel's Bitz Box. Thanks Buck – I’ll add it to the January round-up! If you’re keen for February, it’s Neglected models and (more) terrain. I’ll work on getting at least one neglected model done. Given the number of hideously neglected models I have laying around, it shouldn’t be hard to pick one. An embarrassment of riches! Finished a poxwalker for the challenge. With a little over a week to go, might try and finish another miniature, who knows? I did finish a second poxwalker, and included a picture of both of them together in the post. Thanks Ann. I’ll update the WIPost. Love the challenges and good to hear your work has granted you a well deserved rest. Here we go, more terrain for this month, with bonus Weird Blob of Glue! I do have a neglected model around here somewhere, but at the moment I’ve been chasing a ball of inspiration as far as it will take me and haven’t had a chance to sit down and slog through some good old fashioned Paint the Model with Colours. UPDATE: I did paint two neglected models after all, but I have no clue how long they’ve been neglected for. February challenge, neglected model link below.